Before my trip to Nepal, I scoured the internet searching for the very best Nepal travel tips, what I needed to know for my visit, and the best Nepal packing tips for women. Yet as I kept discovering, most of the information I was able to find was geared toward trekkers. But my trip was focused on the culture and wildlife of Nepal. There were some informative gems I was glad I knew ahead of time, and some other tips I wish I would have known before visiting Nepal. I’ve compiled my top Nepal travel tips so you can be prepared and make the most of your journey, even without trekking. The Hindu culture is conservative, particularly for women. When you are in the large city of Kathmandu dress can be less conservative, but it’s best to be on the safe side and keep your shoulders and knees covered at all times. If you are a tank top fan like me you can still wear one, just make sure to also use a scarf to cover your shoulders. While we’re on the topic of being respectful, be sure to point with your whole hand and not your finger. This is especially important when indicating a sacred object or place. In most places in Nepal, the tap water is not safe for drinking. Avoid wasting plastic bottles and bring your own water filtration bottle. Plastic water bottles create a big litter problem for Nepal and many other Asian countries, so do your best to use as little plastic as possible. After spending some time comparing the best filtered water bottles, I ended up buying the GRAYL Ultralight Water Purifier which I would highly recommend. It protects against pathogens, chemicals, heavy metals, and flavor/odor so you can fill up from any water source and hydrate safely. They may look cute, but you’re better off admiring them from afar. These adorable monkeys have a sneaky side and will grab your food, money, or anything shiny right out of your hands. They are unpredictable and may even bite at times if you appear to be a threat to any of their goodies they’ve gathered. In different tourist areas in Nepal (especially temples), a local may approach you or a group of tourists and start explaining the background and history of the temple or whatever site you’re visiting. As nice as Nepalese people are, this is not one of those cases of a local being friendly. When they are done, they will then be expecting payment for their services. The best way to handle these encounters is to cut them off and simply tell them you already have a guide. Another common scam in Nepal is either a child or a mother and child who will approach you to ask to buy some milk for their baby. They insist they don’t want your money and you can go into the store and buy the milk that they need. The store will then charge the tourist an inflated rate and the scammer will go back into the store and return the milk and share in the profits with the shop owner. In these cases, firmly decline and walk away. These are just a few examples of tourist scams in Nepal, but don’t confuse these scams with thinking Nepal isn’t a safe place to visit. Many places around the world have their own tourist scams. While it is shady behavior, your safety is not compromised in any way. Declining their offer and not showing interest is all you need to do in most cases. Even if you fall for any of the scams, it happens even to the most experienced travelers from time to time. Take it as a lesson learned and know what to do if it happens again. The temples throughout Nepal range in size, religion, and design, but they are all special, sacred places with interesting histories and meanings. keep in mind that some of the popular temples may charge an entrance fee for foreigners. A few of the most common temples in Kathmandu include Swayambhunath, Pashupatinath, and Boudhanath. Swayambhunath Stupa is commonly known as “Monkey Temple” due to the abundance of monkeys on site. Perched upon a hill overlooking Kathmandu valley, this Buddhist stupa is one of the oldest and most sacred religious sites in Nepal. The stupa itself is covered in gold with Buddha’s watchful eyes painted on all four sides, a symbol for him watching from all directions. Seated along the banks of the Bagmati river, Pashupatinath Temple is dedicated to Lord Shiva and is the most important Hindu temple in Nepal. As the largest stupa in Kathmandu and one of the largest in South Asia, the Boudhanath stupa is the center of Tibetan Buddhism in Nepal. The stupa was historically a sacred site on the ancient trade route to Tibet where Tibetan merchants and traders would rest and pray for a safe journey through the Himalayas. It has remained an important place of pilgrimage and meditation both for local Nepalis and Tibetan Buddhists since 1959 when thousands of Tibetans arrived in Nepal after the Chinese invasion. 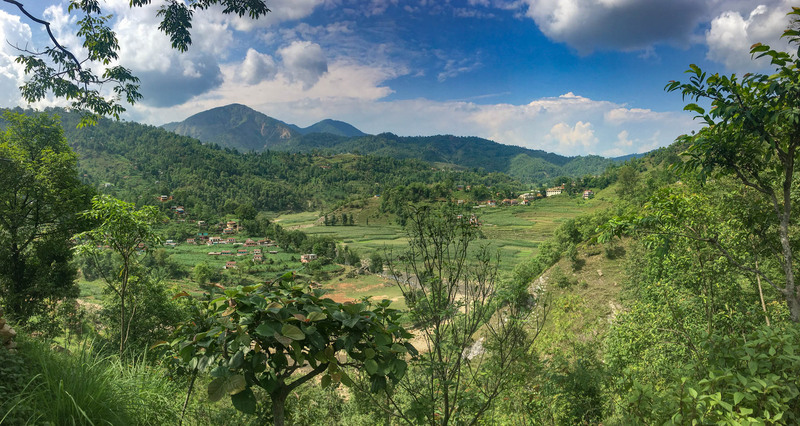 I like the Dramamine less drowsy formula for short flights or bumpy car rides where I want to stay awake – you’re going to thank yourself for all the long bus rides along curvy Nepalese mountain roads. For longer journeys I use the original formula that doubles as a sleeping pill for me as it puts me right to sleep. The streets are always busy, filled with honking horns, chatter, and vehicles going every which way. Especially in Kathmandu, it is crowded pretty much anywhere you go. Prepare to move slowly and be surrounded by crowds on a regular basis. I was overwhelmed by the chaos at first, but as time went on it actually grew on me and I actually started to enjoy it! Climate change has played a major role in rural communities of Nepal, with melting glaciers and disappearing water sources creating added challenges for locals in these communities. Many of them were forced to move into cities because of this, adding to the urban growth challenges. Nepal’s population has grown significantly in the past 50 years. There are also more people migrating to the cities, with 15 times more people living in cities in 2011 compared to 1960. Residents are coming up with creative solutions for the time being, but more sustainable solutions are necessary and are being worked on. The Kathmandu area in particular has very dry, dusty, polluted air with the 2 million people that live in this one city. This is another great reason to have a scarf with you at all times. Use it to protect your nose and mouth from inhaling all the dust and pollutants in the air. Don’t worry, you won’t look out of place — you’ll see many of the locals doing the same or wearing some sort of mask over their faces. Have you visited Nepal? What Nepal travel tips would you add to this list? Super point on conservative dressing Marissa. Save most Western lands you cannot err by being modest. Most of the world covers up. Culture thing. So do as locals do to respect culture and to better enjoy your trip. Smart tips! Thanks Ryan! Definitely, being respectful of culture is so important when traveling, even if that means playing it safe when you’re not sure. Such a awesome experiences and ultimate post! Such a great tips you shared. You captured ultimate post. Thank you so much for sharing a great experiences. Great tips! I didn’t know about the clothes and that you should be modest. Thank you for the update, really useful tips. This is perfect for my travel journey. I will follow your checklist guide.